The U.S. EPA recently issued a report that report highlights a select number of example National Priorities List (NPL) sites where EPA has used innovative and established technologies to restore groundwater for use as a source of drinking water. In these examples groundwater was successfully restored for drinking water use at 17 NPL sites and significant progress toward groundwater restoration was made at an additional 13 NPL sites where contaminants remain above safe drinking water levels. These sites demonstrate how the Superfund program can overcome challenges related to difficult contaminants of concern and complex hydrogeologic settings (May 2018, 114 pages). The report documents where innovative and established technologies have been used to restore groundwater to beneficial use. This report includes a select number of example National Priorities List (NPL) sites where the remedial action objective (RAO) and associated cleanup levels were to restore groundwater for use as a source of drinking water. Groundwater was restored for use as drinking water at 17 NPL sites and significant progress toward groundwater restoration has been made at an additional 13 NPL sites where contaminants remain above safe drinking water levels in only a few groundwater wells. The RAO of restoring groundwater for beneficial use was achieved under the Superfund program, including the successful treatment of groundwater to federal and state maximum contaminant levels for drinking water. These sites are examples of where the Superfund program overcame difficult remediation challenges, such as groundwater contaminated with chlorinated solvents (including the presence of dense non-aqueous phase liquids [DNAPLs]) and complex hydrogeologic settings. 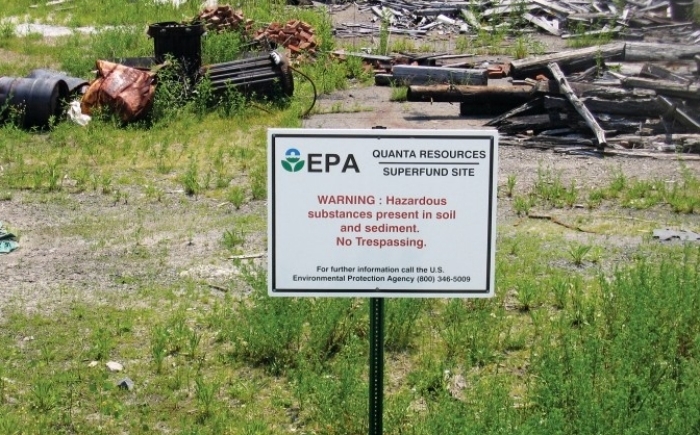 One of 114 Superfund sites in New Jersey, former Edgewater manufacturing site Quanta Resources has been on the National Priorities List since 2002. The NPL sites discussed in this report were selected based on several criteria, including the use of innovative cleanup technologies or approaches to remedy concentrated groundwater plumes. The most commonly occurring contaminants of concern at these sites were chlorinated volatile organic compounds, which were present at 26 of the 30 sites. The less frequently occurring contaminants included metals, non-chlorinated volatile organic compounds, semivolatile organic compounds, polychlorinated biphenyls, and polycyclic aromatic hydrocarbons, with dioxins or pesticides only present at one site. The restoration of groundwater was achieved most often by combining remedial technologies. For example, soil excavation and groundwater extraction and treatment (i.e., pump-and-treat) were used to restore groundwater at 17 of the 30 NPL sites. Given that many of these sites were cleaned up during the period from 1983 to 2000, the remedies used at these sites represented state of the art technologies at that time. These traditional technologies were often modified or replaced with innovative technologies such as in situ bioremediation, in situ chemical oxidation (ISCO), in situ thermal treatment (ISTT) or monitored natural attenuation (MNA) at some sites. The application of remedial technologies at these sites decreased contaminant concentrations from 90% up to 99.99% (i.e., one to more than four orders of magnitude). DNAPLs were found or suspected at eight of the 30 sites. A combination of excavation and pumpand-treat was used most often to remediate these sites along with at least one other technology or approach such as vertical engineered barrier, air sparging, in situ bioremediation, STT, or MNA. Of the eight DNAPL sites, groundwater was restored for use as drinking water at three sites and significant progress towards restoration has been made at five sites. These findings indicate that the Superfund program has achieved the cleanup of sites with DNAPLs. The time required to restore groundwater for use as drinking water at the 17 NPL sites ranged from three to 27 years with a median time of eight years. Cleanup time generally increased as the amount of contaminant removed increased with the exception of four sites where contaminant concentrations were decreased by nearly 99.99% in less than eight years. Cleanup times were generally shorter for sites with less complex hydrogeologic settings with the exception of three sites with mild heterogeneity that required more than 15 years to restore groundwater. Also, in most cases, cleanup times were shorter for lesser reductions in concentration. All of the 30 sites, with the exception of two, have achieved the status of sitewide ready for anticipated reuse (SWRAU), and 12 of these sites have been returned to use either in whole or in part. Reuse includes industrial and commercial redevelopment, recreational use, alternative energy use, and lifting of groundwater use restrictions. View or download at http://www.epa.gov/remedytech/examples-groundwater-remediation-npl-sites.